xpungeUSA is a law firm spearheaded by some of the top criminal defense attorneys in the state. Headquartered in Los Angeles, with offices across California, we specialize in post-conviction criminal law that you can take advantage of to live a better life. We were hired to create an online platform for the xpungeUSA. The project required a mobile optimized web design. We were tasked with creating a universe of information and visuals. This site, like all of our sites is custom coded from top to bottom and mobile responsive, with a back end that is easy to use, edit and update. The site includes a blog, integrating and managing social media networks, user friendly CMS, and is fully search engine optimized. The website was built with WordPress allowing the xpungeUSA team to easily manage all website content. We crafted exciting designs with a lovely feel to match xpungeUSA vision. 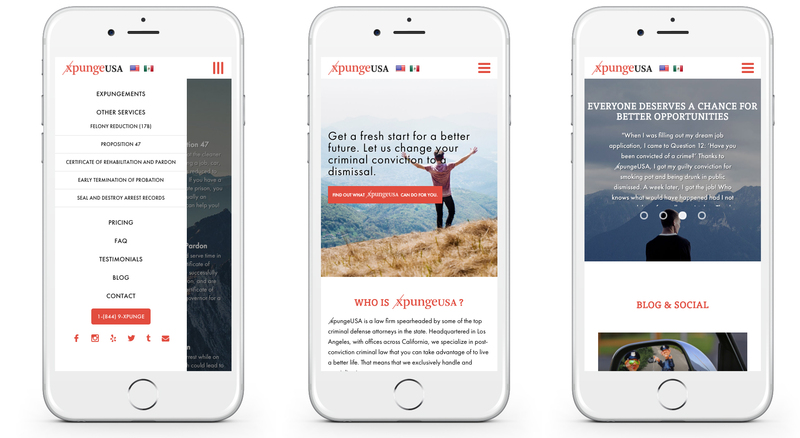 We designed the website with a mobile first approach which resulted in it being optimized across devices of any size, while still keeping unique xpungeUSA brand vision intact.